If You Want My Body…and a Giveaway! Lauren Carr is the best-selling author of the Mac Faraday Mysteries, which takes place in Deep Creek Lake, Maryland. Killer in the Band is the third installment in the Lovers in Crime Mystery series. 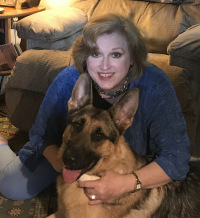 In addition to her series set in the northern panhandle of West Virginia, Lauren Carr has also written the Mac Faraday Mysteries, set on Deep Creek Lake in western Maryland, and the Thorny Rose Mysteries, set in Washington DC. The second installment in the Thorny Rose Mysteries, which features Joshua Thornton’s son Murphy and Jessica Faraday, Mac’s daughter, A Fine Year for Murder, was released in January 2017. The next book, Twofer Murder, will be released at the end of the year.